Great tasting hot beverages from vending machines. One of the major causes of vending machine breakdowns and taste problems is caused by poor quality water. An efficient and effective water filter changed at regular intervals ensure good quality drinks as well as protecting boilers and internal pipes from the damaging effects of limescale. 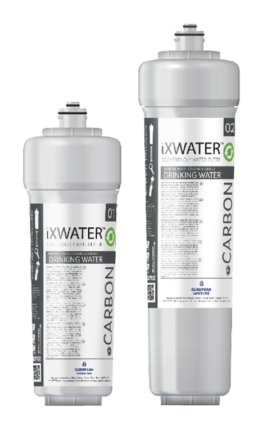 WaterCare provide a range of specialist water filters for vending operators whether it be the popular WaterCare iX range of cost saving refill replacement filters or partner brand filtration from Pentair Everpure, Brita, 3M or BWT. WaterCare provides the one stop shop for all your vending filtration needs including filters, hoses, fittings and spares. 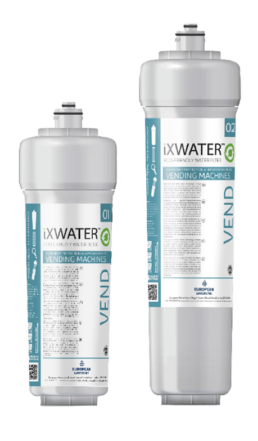 The iX VEND has a 5-stage filtration process designed to provide high quality water, improving taste, colour and odour whilst inhibiting scale for high volume hot beverage and vending applications. The filter reduces sediment and chlorine whilst protecting against bacteria and water borne cysts. iX VEND’s in-built scale inhibition dramatically reduces scale build up and saves energy. The simple installation and quick replacement makes it the ideal choice for caterers and vending operators requiring high volume, safe water treatment whilst making considerable cost savings. The ideal water filter choice for vending equipment and coffee dispensers. The iX Vend is the first truly eco-friendly cartridge filter made in Britain, offering Insert Refill Technology to provide a genuinely sustainable and cost effective alternative to mainstream cartridge filters already in the marketplace. The water filter for vending machines and drink dispensers.